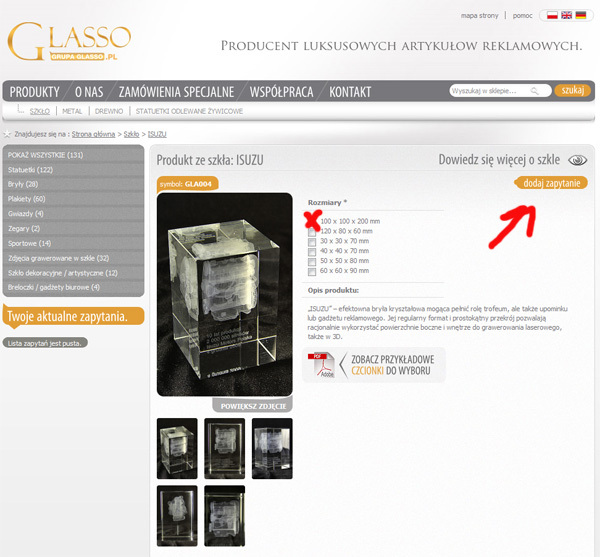 How to browse our website glassogroup.com? What is the order turnaround time? What is a 3D Visualization? What do I need in order to request 3D Visualization? What type of files (logos, pictures) are accepted for 3D Visualization? Can I make changes after I place an order? What if my order required customization? How to navigate our website glassogroup.com? Navigating our website is just like any other e-commerce website. Our company has simplified the inquiry process by replacing a standard shopping cart with an inquiry form that is displayed on the left column after you select a product size and click on Get quote. If you are interested in our statuettes please call us or e-mail us. We work with corporate as well as individual clients. We work very fast and all our products are guaranteed highest quality. Our consultants will help you to choose the right solution to your project and work with you to adjust to your deadline. We are ready to help you and answer any questions or concerns you many have. Our working hours are Monday thru Friday from 8 AM to 6 PM Central Standard Time (CST). Because all our products are custom, we are not able to accept returns. Once your order is manufactured, it is not possible to return it for a refund. Our ordering process is designed to eliminate the need for a return. Each order is made exactly to client’s specifications and manufactured only after a written acceptance. 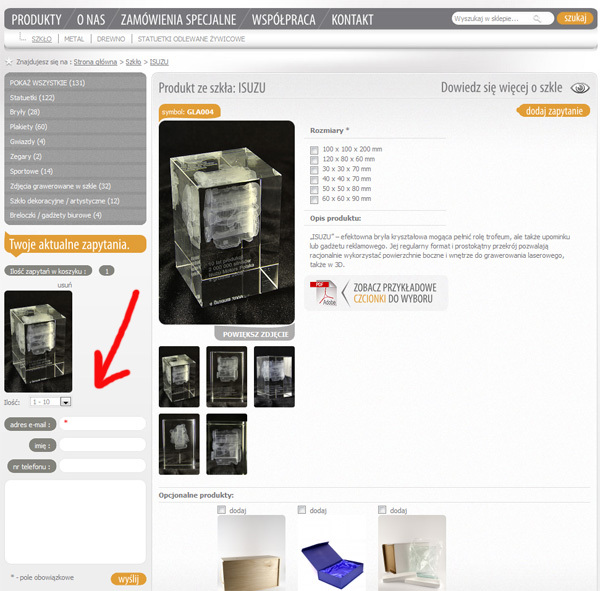 Each order receives a 3D Visualization, a computer simulation of a product before it is manufactured. Based on this visualization, a client is able to make corrections and/or changes. Each order requires clients approval before it is manufactured. In the event your product or products get damaged during shipping, we guarantee a free replacement. All orders are shipped via FedEx. Ground shipments take anywhere from 1 to 3 business days for arrival depending on your location. For orders with tight deadlines, we can ship express 1 day or overnight. All shipments are insured for the total order amount. We accept all major credit cards, bank wire transfers or business checks. The ordering process is divided by several stages. During the first phase we work with the client to help them choose the best product based on their budget, turnaround time as well as personal preference. We offer multiple different products such as, glass, metal, wood, 3d print and resin. The product selection is based on the budget as well as what occasion the product is to be presented at. All our clients receive our references by email upon request which will based on both individual as well as corporate projects. In the next stage we prepare a custom quote which is based on time and quantity. We than prepare a product visualization which lets the client see how a finished product will look before it is produced. After acceptance and/or modification we start the production stage. At the final stage, the product undergoes quality control, packed and shipped to the client. Beginning from the order date, the turnaround time may be from 3 to 20 business days. All orders are different and the turnaround time depends on many factors, such as quantity, material, complexity etc. Visualization production times are usually no longer than 1 or 2 days. Production time varies from 1 to 9 days depending on complexity and quantity as well as warehouse availability. Shipping can be express or ground depending on the needs of a client. Turnaround time is calculated and agreed upon between us and the client before the order is placed. A 3D visualization is a computer simulated rendering of a finished product. This is presented to the client before any payments, orders or decisions are made. This enables the client to actually see the product, make corrections and/or additions before the product is manufactured. Thanks to photo realistic qualities of all our visualizations, we are sure that the finished product will look virtually the same. This ensures that the client will receive exactly the product they ordered without any spelling mistakes or surprises. There are two types of laser engravings – 2D and 3D. 2D engraving can be created on both, the surface or inside of the crystal. It is essentially a flat picture laser engraved almost as if it was printed on a piece of paper. 3D engraving happens inside the crystal and can be seen from all dimensions. In order to 3D engrave a logo, picture text or any other object, we use specialized 3D modeling software to create a 3D model of your object. We prefer vector based files for logos however other files can also be used. For a 3D engraving of an object, we require several pictures of the object from different angles and sides so that we can properly draw a 3D computer model of it. We currently possess a large number of 3D modeled objects that could also be used for your project. Please let us know if you any questions. For all logos we require high resolution files. In order to keep all the details. We recommend file formats such as PSD or EPS (Photoshop) , CDR (Corel Draw) , AI (Adobe Illustrator) or PDF or other vector based files. For more advanced and complex objects that require precision and details (ex. Parts) we prefer 3D models such as MAX (3D Studio Max), MA (Maya) or Solid Works. Sure you can. Changes can be accepted as long as a product is not yet being produced. Can you create totally custom or unusual orders? We are able to create any statue or award. Please let us know your idea and we will be happy to work with you to turn it into a real product. We guarantee highest guarantee of all of our products. Our clients range from small individuals to large corporations. All of our crystals are guaranteed to be of highest quality. We use optical crystal (K9) for all of our crystal based products. This glass is used to produce lenses as well as prisms for laser generators. The glass has a very low iron content and possesses the best transparency qualities.